Are you two dealing with debt? Learn how you can approach it so you’re fighting the debt and not each other. Note: This is a question I received from a reader and he kindly agreed to let me share his situation along with my response. (some details have been adjusted for privacy). Which Order Should Debt Be Paid? I am a 220-something-year-old small business owner with some uneven financial history. I am at the stage in my life where I have to buckle down and fix my credit, get out of debt, and build a solid financial future with my fiancee. My fiancee recently got a job and so we will have a consistent income for the first time in 2 years. We would like to take this opportunity to get out of debt. 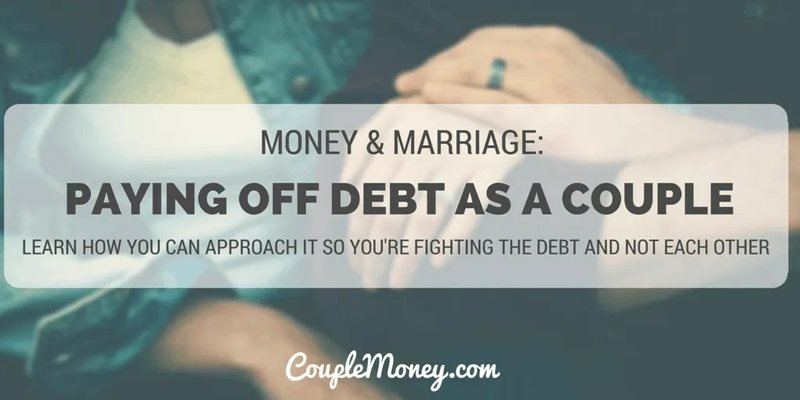 We are getting married this summer (small debt free wedding) and I am trying to figure out should we eliminate our debts together? Or should we pick one person to get debt free and raise their credit then attack the other persons debts? We can put a little over $600/month towards our debts for the next 24 months which will get either of us out of debt, but not both. If we apply it across the board we will both have less negative accounts on our credit scores but will both still be in debt. We can of course keep paying off the debts. I think it’s great that the two of them have decided to work together on their finances and allocated $600/month to pay it down. It sounds simple, but family finances can be incredibly hard if the two of you aren’t on the same page. My response was basically that getting rid of both of their debts is important for financial and relationship reasons. When we went to compare mortgage rates, the loan officer told us that they look at the lowest score between the two of us to determine the rates they’ll offer. If these two are seeking to build their credit scores for a future purchase, like a mortgage, then increasing both of your scores is key. What’s great with their plan of paying off the debt is that while they lowering the balances, they are in effect raising their credit score in more than one way. How? Being consistent on their debt snowball can help them improve their credit history and reduce the amount they owe. That’s 65% of their credit score. Here’s a link to my debt reduction guide for more details. I would also add tapping into resources like personal blogs to find how one can further reduce their monthly expenses. A great one that I read regularly is Mr. Money Mustache. Regular readers will probably remember the 50/50 challenge I ran last fall that shared tips on how to earn more and save more. Working together on both of their accounts would also be beneficial for the relationship. It reinforces the idea that they are a team and both of them deserve attention. Of course, only those two knows what is best for them. I’d love to hear your ideas on this situation. What do you think these two can do to speed up the process? Please feel free to email me if you have a money question. I would probably divide the payments 50/50. Great advice! Definitely paying down both 50/50 will get them where they want to be. Any positive adjustment to their credit-to-debt ratio overall will be a huge step in the right direction for both.